The book is heavy, and filled with pictures and history. There are interviews with Queen Margrethe, Prince Henrik and Crown Prince Frederik and on their relationship with the palace. The colonnade was made of wood in the late 179os for practical reasons and as they didn’t expect it to have to last long. It was painted with grey paint, and sand was thrown on the wet paint. It is still standing, and still made of wood. There is a 2,5 metres wide hallway in the top, a couple of metres tall. The colonnade was put up to solve the lack of connections between two of the palaces, then used by the King and the Crown Prince. The royal book collection has its storage collection in the basement under Christian VIII’s Palace, where it was placed after a renovation after Hereditary Prince Knud’s death. After Christian IX’s death in 1906, his palace was left to itself until the 1940s. (His daughter Dagmar lived there for a while after she came as a refugee from the Russian revolution, but changed very little.) Then Crown Princess Ingrid and Princess Caroline-Mathilde ensured that it was photographed and put into storage – and its contents are, partially, the Amalienborg museum. In the interview with Queen Margrethe she remembers the shouting from the people in the side streets to the palace square on May 4th, 1945, when Denmark had been liberated from the Germans. (The Palace square had been blocked off.) The days after, there were still shooting going on, so her parents went with her and her sister down into the basement at the palace for safety. She also remember the first time the royal guards marched into the palace square, and she could remember their songs from her father’s records. We have under no circumstances a 8-16 working day. We work when we work, and sometimes it is much more than that and sometimes it is not quite as much. Sometimes you have vacation, but really, you’re always on the go, because one’s person and one’s function is two sides of the same coin. That’s how I see it. – Margrethe on working where you live. 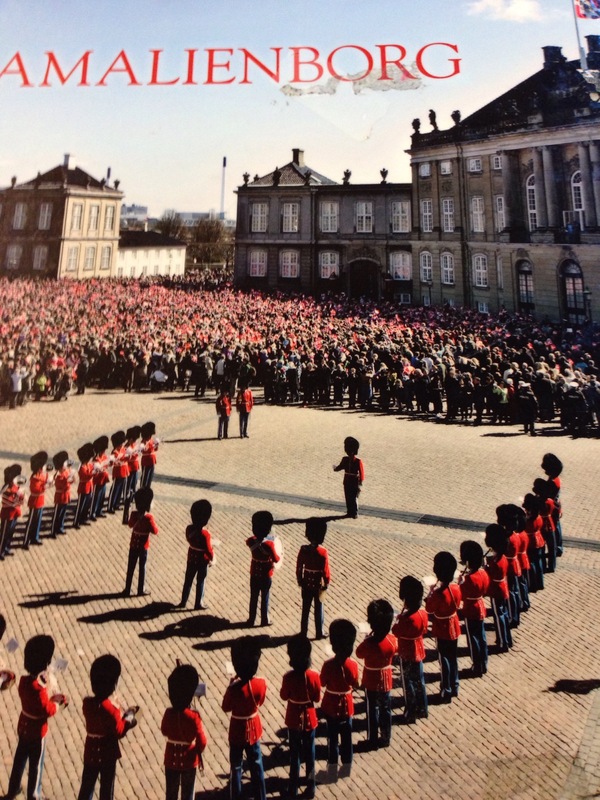 It was an extreme experience [to step out on the Amalienborg balcony on her own for the first time] – it was quite overwhelming. My father helped me. He said “You have to remember to accept when people wave and shout Hurrah. You have to do it like this,” the Queen says, and shows with her hands how her father illustrated a hug in the air. On the new year’s speech, which is a collaboration between the Ministry of State and the Queen. I trust that the Prime Minister would stop me if I got too far into it [politically]. On the other hand if I had to give a speech where did not risk being told to mind it a bit, I would never be able to say anything. The New Year’s Speech is about my country, first and foremost. That’s supposed to be the topic of it. My mother had seen red palace interiors from her childhood, and I was thus raised with the belief that we don’t have it. So I answered him: “If you want a red salon, I want a green one.” When I had said green, he said that it would be amazing if we got a strong red colour in one room, and the next was a strong green. It ended up like that and we think that it is amusing and successful. When we moved upstairs, we got more space. There was a big playroom, and a long hallway where we would roller-skate. My father did not find that fun. It made quite a bit of noise on the floors below. Essentially we’re a bunch of gypsies, luxury gypsies. We travel. We don’t have one home. We have four-five-six homes, and we have that because we belong to all the nation. It is not a new tradition – all the European royal houses used to do it like this once upon a time. The book is full of interviews, and an odd mix of interviews and quotes from interviews from other places. It is, maybe, at times a bit much – and I’m unsure how much of the interviews are related to Amalienborg itself and how much is about royals growing up and reminiscing. I’m definitely sure that a part of it could be cut away – the life story of Prince Henrik which he has written about in a book of its own and doesn’t directly relate to Amalienborg. But at the same time, it is also filled with facts, and pictures about the life at Amalienborg – the guards, the staff and so on. If you can get access to the book, and read Danish, I really recommend it. (Try inter-library loan if your library does not have it.) If you don’t read Danish, the pictures are still interesting, but maybe not to the level of trying to get the book.